Sheila Mills's story is a unique perspective of the Second World War. 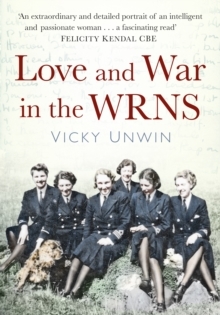 She is a clever, middle-class Norfolk girl with a yen for adventure and joins the WRNS in 1940 to escape the shackles of secretarial work in London, her unhappy childhood and her social-climbing mother. From a first posting in Scotland in 1940, she progresses through the ranks, first to Egypt and later to a vanquished Germany. Extraordinary and fascinating encounters and personalities are seen through the eyes of a young Wren officer: Admiral Ramsay, the Invasion of Sicily, The Flap, the sinking of the Medway, the surrender of the Italian fleet and the Belsen Trials. These observations are peppered with humorous insights into the humdrum preoccupations of a typical Wren - boys, appearance and having fun, while worrying about home and family. This treasure trove of hundreds of letters, along with scrapbooks and memorabilia, some of which are reproduced here, was discovered in bin liners shortly after Sheila died. Her daughter, Vicky, has pieced together a fascinating and unusual record of the Second World War from a woman's perspective.